Who knew murder could be so funny? I'd never seen the 1944 movie Arsenic and Old Lace but I knew the general idea - sweet old ladies who poison people. It was great fun to watch it all unfold in hilarious fashion with a fantastic cast of Guthrie favorites, led by Sally Wingert (who has appeared in over 75 Guthrie productions) as Martha Brewster. Her sister and partner in crime, Abby, is played by 1980-83 Guthrie company member Kristine Nielsen, whom I last saw as the storyteller in the weird and wonderful Bloody Bloody Andrew Jackson on Broadway. Both women are wonderful as the wealthy sisters who take their charity to lethal levels - putting "lonely" people out of their misery and giving them a lovely burial in their cellar. They really think they're doing a kindness! Martha and Abby are not the only crazy Brewsters; madness runs in the family. The sisters have three nephews. Teddy (another Guthrie regular, Bob Davis) lives with them and thinks he's Teddy Roosevelt. He dresses the part, thinks the basement is Panama, and yells "charge" every time he ascends the stairs. Teddy's brother Mortimer (the always charming Jonas Goslow) seems quite normal and well-adjusted; he's a theater critic (which allows playwright Joseph Kesslring to get in many jokes about the theater and critics) and newly engaged. His fiance Elaine (Kathryn Lawrey) is a smart and spunky minister's daughter, who's also a neighbor and friend of the Brewster sisters (and she wears fabulous shoes). Mortimer loves his aunties and is quite shocked when he stumbles upon their dirty little secret. Instead of turning them in, he tries to find a way to protect them and get them out of the situation, even though they don't think they need any help. The third brother is the long absent Jonathan, who left town as a troubled teenager, and continued in his devious ways. He's on the run from the law and comes home to hide, bringing some baggage with him. Jonathan (Tyson Forbes) is a tall, creepy figure out of an old horror movie (his face has been surgically altered to look like Boris Karloff). Accompanying him is his plastic surgeon accomplice Dr. Einsten (the hilarious Kris Nelson, who recently showed his dramatic side in Ten Thousand Things' Doubt, in which he co-starred with Sally Wingert). The aunts and Mortimer try to get rid of Jonathan, but he insists on staying. He soon discovers their secret and uses that as leverage. In the end, Mortimer devises a complicated plan to solve the aunts' problem as well as get rid of his criminal brother, with the help of some bumbling police officers who happen to come in at the right time. And his fears about going mad like the rest of his family are alleviated when he finds out an interesting bit of news about his past. The entire play takes place in the Brewster family home in Brooklyn. The two-story set looks like a child's dollhouse cracked open to reveal the details of a charming traditional old home. 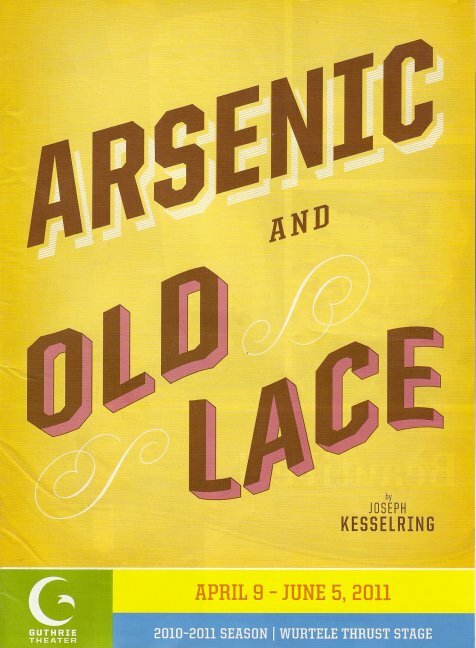 Arsenic and Old Lace, directed by Artistic Director Joe Dowling, is another quality production from the Guthrie. Which reminds me, it's time to renew my season subscription! The 2011-2012 season, which will be my ninth season as a subscriber, features Shakespeare, Greek tragedy, Neil Simon, Tennessee Williams, a Cole Porter musical, and a production with the Penumbra Theatre Company. A little bit of everything and a lot I'm not familiar with. Which should add up to another great season.